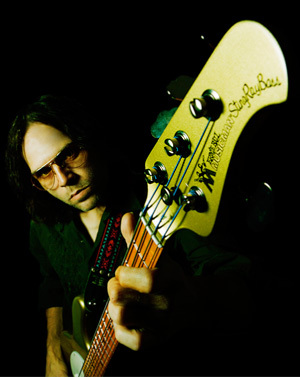 Craig Young is a professional bassist / writer / producer from California's Bay Area, currently residing in Nashville, TN. Craig got his start when he was recruited by legendary British Producer, Peter Collins, to play bass on the re-produced for radio "singles versions" of "You Were Meant For Me" and "Foolish Games" off of Jewel's first album, the over 12 times multi-platinum "Pieces Of You." Craig also toured with Jewel on Lilith Fair, before signing his own publishing deal with EMI Music Publishing NYC, moving to Manhattan and writing / producing songs with artists such as Jessica Simpson, Lady Gaga and Joey McEntire out of his Upper West Side home studio. Wanting a slower pace for his family, he traded the hustle and bustle of the city for the rolling hills of Nashville, TN where he now lives with his wife and four children. He is a member of the Nashville A Team of session players in Music City, and has played on 100s of albums for artists such as Lady Antebellum, Elton John, The Indigo Girls, The Wreckers, Peter Frampton, Michael McDonald, Nappy Roots, and Megadeth to name just a few. Many of these albums have gone on to be huge multiplatinum sellers, spawned multiple top 40 singles, and a handful of #1 smash radio singles on the Billboard Charts. Craig has also contributed to the soundtracks for movies such as Batman And Robin, Bridget Jones Diary and the South Park movie, among many others. Craig feels that being a writer and producer as well as bass player gives him a special edge, and a knack for creating melodic baselines that become the essential foundation and harmonic support of whatever project he happens to be working on, in whatever genre. This has literally ranged from heavy metal, to hip hop, to country. In between recording sessions on Nashville's Music Row, Craig is currently working on his own album and plans to have it released by mid-2011.